The Agreement on education and cultural affairs has been contentious in Spain where the divisions of the civil war period linger on. There is strong opposition in some quarters to the Education Concordat whose Article 2 mandates Catholic religious education as a core subject in state schools. Such classes were the topic of a 2009 Vatican directive, in an apparent attempt to tighten them up worldwide. The Vatican Congregation for Catholic Education criticised teaching children about religion in general, rather than teaching them Catholic doctrine in particular. 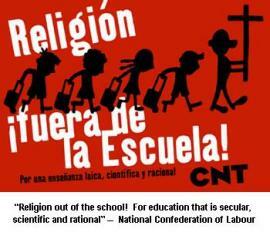 In opposition to this, a poster of the National Confederation of Labour, a labour union that was banned by Franco reads: Religion in the schools? No, thank you! The Agreement on the armed forces had to be revised when the Catholic Church ceased to be the state church. Something had to be done with the part of Franco's concordat (Final Protocol note on Article 32) about the jurisdiction of Cahtolic chaplains. This section had the military chaplains minister "to all Army, Navy and Air Force personnel on active service [...] to their wives and children who reside with them, to students at Military academies and schools". Yes, "all" of them, thus implying that one could not be a member of the Spanish armed forces unless one was Catholic. In the Agreement on legal affairs Article I.6, stipulates that all Church records are to be kept “inviolable”, which would hide any documentary evidence of Church collusion with Franco. (A similar secrecy clause in the 1992 concordat with the Côte d'Ivoire provides for the movement of large amounts of money to the Vatican from an impoverished African nation.) And, indeed, in almost thirty years after the secrecy of Spanish Church records was inserted in this way into treaty law, Spain finally opened its first criminal investigation into Franco-era executions and repression. In 2008 a Spanish judge ordered state bureaucrats and the Roman Catholic church to hand over to investigators all relevant documentation. However, a right-wing group successfully challenged the inquiry in the Supreme Court. This shocked many, including a leading international jurist who said the prosecution of judges for carrying out their professional work was "an inappropriate and unwarranted interference with the independence of the judicial process". This attack on the judge protected the Church records proactively, so that the legal concordat did not even need to be invoked. 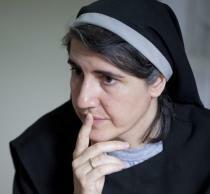 Benedictine nun Teresa Forcades says that concordat tax privileges should be revoked. Also controversial is the continuing state aid to the Catholic Church despite promises in the financial concordat. Articles II.4 and II.5 of the Financial Concordat oblige Spanish taxpayers to supplement the church tax by giving the Church a “top-up” to help meet its expenses. (ANSAmed) - MADRID, MARCH 8 - The Foreign Affairs Commission of the Spanish Congress has rejected a motion of the left-wing parties on a revision of the agreements closed by the Spanish State and the Holy See in 1976 and 1979, the Spanish media report today. 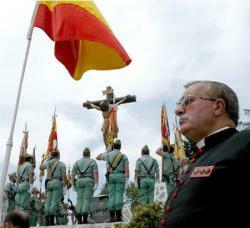 The motion of the PSOE council group and the Galician Nationalist Bloc (BNG), asked the government of Mariano Rajoy to revise the legal, cultural and economic aspects of the deals as well as the religious presence in the armed forces that is part of the agreements, in order to defend the state's secularity and stress the non-denominational character of the Spanish Constitution. The motion also proposes tax payments for the religious institutions present in Spain, on the same level as other institutions. The PSOE, BNA, the leftwing non-denominational coalition and the constitutional UpyD party voted for the motion, but it was rejected by the overwhelming majority of the PP, together with the Catalan Christian Democratic CiU party.